Celebrate your favorite photo while adding a sophisticated flair to your interior décor! Upload your photo to Print Shop and within minutes you can create unique wall art that’s full or color, personality and style. Our floating canvas is available in a range of custom options so you can design it to perfectly compliment any photo from your collection. Floating Canvas Frame allows the wrapped edge of the canvas to remain exposed so the canvas “floats” within the frame to add depth to your photo memory. What Is A Floating Canvas Frame? 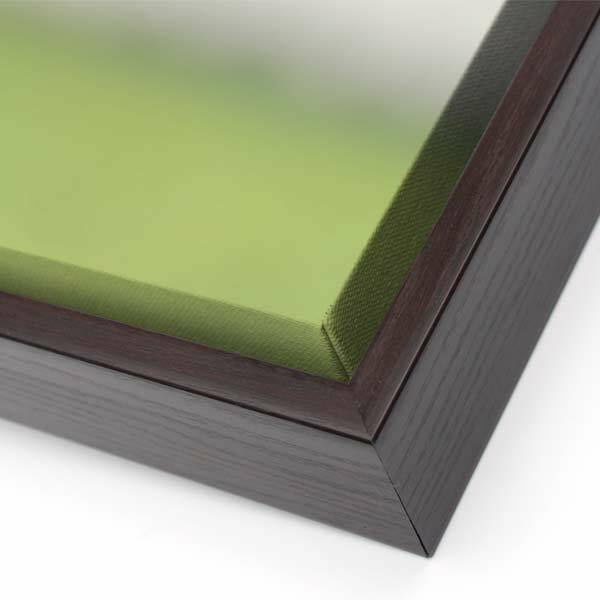 Floating frames combine the beauty of gallery wrapped canvases with the style of a framed print. Your photo is custom printed on a wrapped canvas which is then set in frame so that it appears to “float” giving it that modern edge. Floating canvases have a unique look which is perfect for any contemporary interior. Print formal family portraits or candid snapshots that you can upload from your phone. 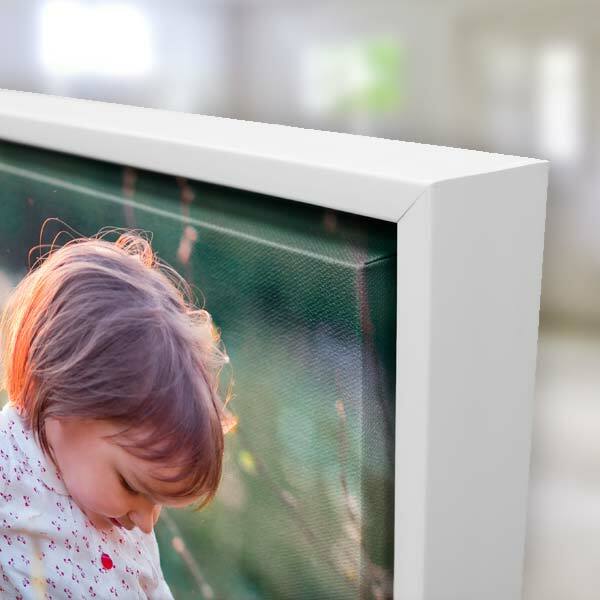 In addition to picking out a floating canvas frame finish, you can also customize your canvas’s edges by having your photo wrap around the sides or by selecting a custom color! With our online canvas maker, the possibilities are endless. 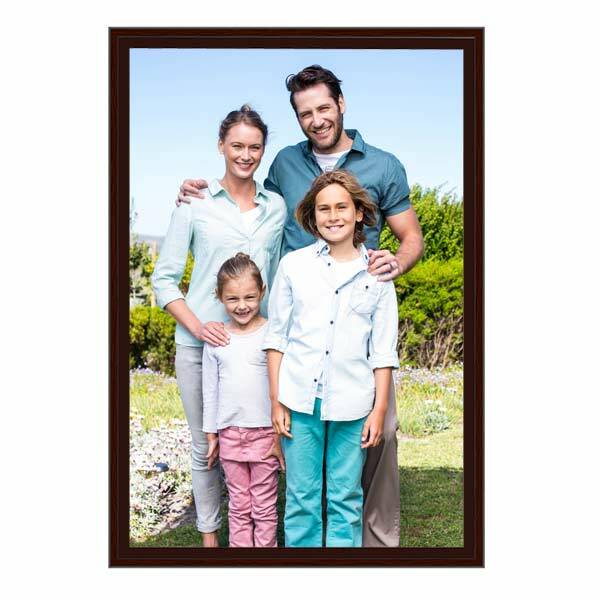 In addition to various sizes, you can personalize your floating canvas with three frame finishes. Select from walnut, black, and white to compliment your décor. Then choose either a custom color or wrapped photo edge for the gallery canvas portion of your print. With our color option, you can select a hue that compliments the colors in your photo. Or, go with our photo wrapped edges for a more traditional gallery canvas look. There are hundreds of combinations you can choose from so you can highlight your cherished memory to your exact specifications! Making your own wall décor has never been this simple. Using our site is easier than shopping at local stores in your area when you’re looking for just the right piece to hang on your wall. Furthermore, you can use your favorite photo to create something special that comes from the heart. Just upload your photo to get started, choose your canvas size, and pick out your canvas edges and frame finish to complete your project. Once your order arrives, you can hang it up instantly using the pre-mounted hanging hardware! Talk about simple! Get exactly what you want and create a one-of-a-kind photo canvas that you and your family will enjoy for years to come! After browsing your phone or laptop, you probably will come across dozens of digital images from your collection that are worth printing on canvas. Maybe you have a colorful picture of Mom. Or, you found a cute picture of the kids at the playground that you forgot about. No matter the photo, you can select a floating canvas frame and upload your photo to create a special gift! There’s no better way to commemorate a fond remembrance than by having it custom printed and hung on your wall for all to see. Photos are perfect for giving your home a warm, personalized feel! You can showcase them in a number of ways, and our floating canvas photo prints are no exception. Whether your style is cozy and rustic, or elegant and modern, you can create the perfect canvas to enhance any drab wall. Choose a photo that captures the mood and go with a frame finish and canvas edge that compliments your décor. Pick a frame that goes with your furniture finish. Then choose a color for the canvas that matches your room’s color palette. We also offer photo wrapped sides that go with practically any look. As you can see, we have all the custom options you need to make your wall décor picture perfect. Furthermore, you can create your own wall art with just a few simple steps. Photos on canvas are ideal when you’re looking for something that brightens your home with character and individuality! Speaking of character and individuality, we also offer square prints on floating frame canvases that can add a unique twist to your home! Order a 16×16 canvas print to display on you foyer wall or go with a 36×36 to hang on your living room’s most prominent wall. Square prints are perfect for featuring any picture and especially your Instagram memories! Upload any picture to Print Shop and turn it into unique wall decor that you and your family can cherish year after year! Nothing makes a loved one smile like a gift that’s created from heart. With our floating canvases, you can design them with a favorite photo to make the perfect gift that everyone on your shopping list will love. From birthdays and holidays, to graduations and anniversaries, you can create something that your loved ones won’t soon forget. Maybe your sister just moved to a new place and you’re looking for a housewarming gift. Upload your sister’s favorite photo from your phone or Facebook, and give her something that’s unique. If you’ve been searching for a one-of-a-kind gift for Father’s Day, our personalized photo canvases is also a great choice. Find Dad’s favorite photo and create a canvas print that he can hang at home or the office. Custom printed canvases can be displayed virtually anywhere so they’re not only stylish, but versatile too! As you know, Print Shop offers the cheapest photo prints online! In addition to high quality photos, we have an array of custom canvases that you can create to decorate your home with a personalized flair. Probably our most popular option is our gallery photo wrapped canvas! Get that sophisticated modern look without breaking the bank and choose from multiple sizes to add color and life to any wall in your home! Our wrapped canvas comes in multiple sizes so you can create photo art for a focal wall in your living room or a small nook in your kitchen. Besides, gallery wrapped canvases, we have two framed canvas styles that will make any photo stand out. Our classic framed canvas has a simple yet elegant frame making it perfect for modern interiors. Looking for something more traditional? Our wood framed canvas prints have a frame that’s reminiscent of classical molding. Instead of hanging your canvas on a wall, you can also display it on a table or shelf with our easel back canvas prints! Select a photo and brighten up your living room end table with a favorite memory. 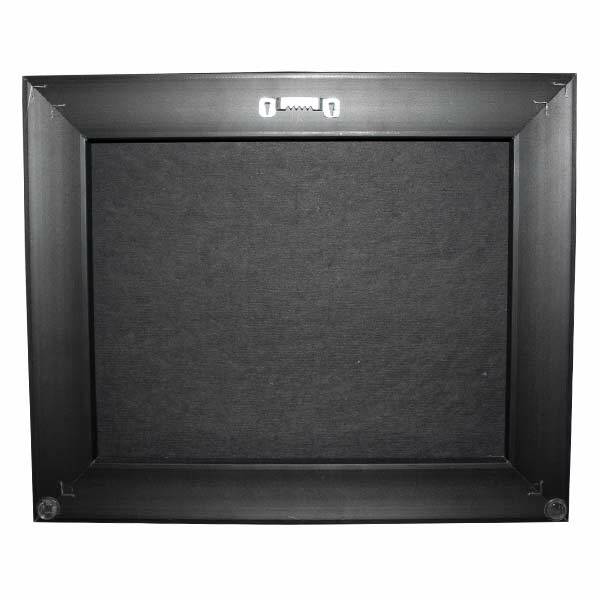 Our easel back canvas has wrapped edges and includes hanging hardware as well should you decide to display it on a wall instead of a flat surface! At Print Shop Lab, you can transform any photo into a canvas wall art! Preserve your fondest memories while creating a special keepsake that enhances the look of your home. Photo canvas prints are a popular décor accessory that are a must-have for a stylish home!